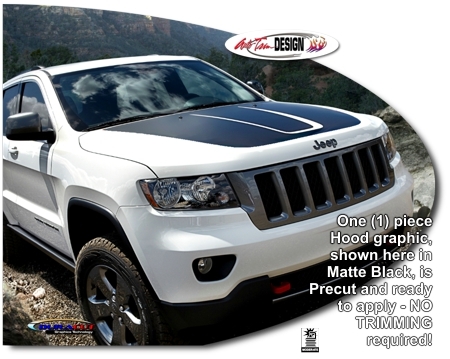 Make your '11-Current Jeep Grand Cherokee's Hood stand out with this great-looking Trailhawk style Hood Graphic kit. Kit is specifically made for the '11-Current Jeep Grand Cherokee factory Hood and will not fit any other vehicle. OEM Jeep Grand Cherokee Trailhawk graphic features a Red highlight at sides and front of graphic. While our kit is close to the same overall outer shape and size, it is only offered in a monotone color as selected when ordering.